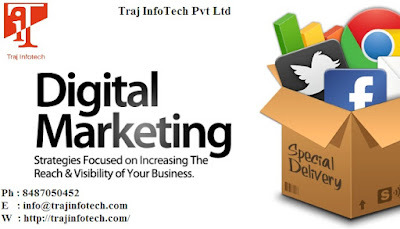 Traj Infotech: A Good Marketing Strategy Will Boost Your Digital Marketing Campaign. A Good Marketing Strategy Will Boost Your Digital Marketing Campaign. One cannot deny that more and more people are moving towards digital content. Consumers can use their desktop computer, tablet, mobile phone, laptop and others for digital content. Organizations should provide strategies that are easily adaptable. Any service that offers Digital Marketing usually utilizes the data, research, planning, persistence and strategy for each customized digital marketing campaign. A customized strategy can enhance all the digital channels that will help the digital marketing of your business. Compare to the old ways of marketing digital marketing is more user friendly. In digital marketing, no material is used, saving the environment from any harm. Digital marketing is required these days because it helps your business in moving ahead or progressing. You need to have a goal – Planning is very crucial in a business, nothing can work without it. You need to have a goal that your Digital Marketing campaign needs to achieve. You can think of expanding your business newsletter subscriptions. This maybe an achievable objective, as a business you need to plan more goals and provide a digital marketing strategy that is goal oriented. Simple – The reason why your business is not able to grow or your product is not able to sell and your customers are not able to understand or confused. No confused customer will ever buy a product. If you take a look at your website offering your products or services, it probably has too much information making it difficult for the customer to take a decision. It is better to keep the information on your website simple and not complex. Search engine – Now days, most customers look for information online through various methods. Search Engine is one of the methods. To ensure your website is among the first few pages of the search result, for this you need to optimize your website; this will help in customers identifying your website. Implementing a good strategy will improve the visibility and potential for an extensive range of opportunities. Looking for other options – Website is not the only option; you can keep your audience engaged through other options. Remember, more the better. You can use your marketing campaign also on Facebook, YouTube and Twitter. The benefits are it will keep your potential customers engaged and can get excellent results.